-4 yards of tulle. I bought 2 yards of each color of pink to spice it up a little. You could even choose four colors and buy one yard of each. Step 2: Start with the folded edge and begin rolling to the other end. Try and keep wrinkles out as best you can but don't worry if it's not perfect. Step 3: Cut off a little on both ends so you have an even edge. Then cut 3 inch chunks of rolled up tulle. Step 4: Since my tulle was 2 yards long, I cut it in half to get the right length. So basically you want each strip of tulle to be a yard in length. Step 5: Tie knots in your ribbon. I used really skinny ribbon because that is what I had around the house, but it would be really cute with thick satin ribbon. Cut 60 inches of ribbon and tie two knots in it at every 20 inches. The space in between the two knots is where you will attach the tulle. The ribbon on the other side of the knots is used for tying a bow around your child's waist. 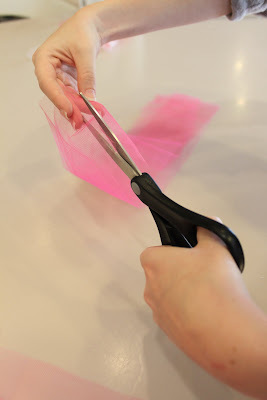 Step 6: Take a strip of tulle and fold it in half like this, leaving room at the fold so you can tie it onto the ribbon. We will call it a loop. Step 8: Take the end of the tulle and tie it through the the loop. The ribbon is in the middle of all of this. That is how you attach it. Slide it right next to the knot. Now continue on. I did a pattern alternating dark pink then light pink. Pull them tight and slide them next to each other. 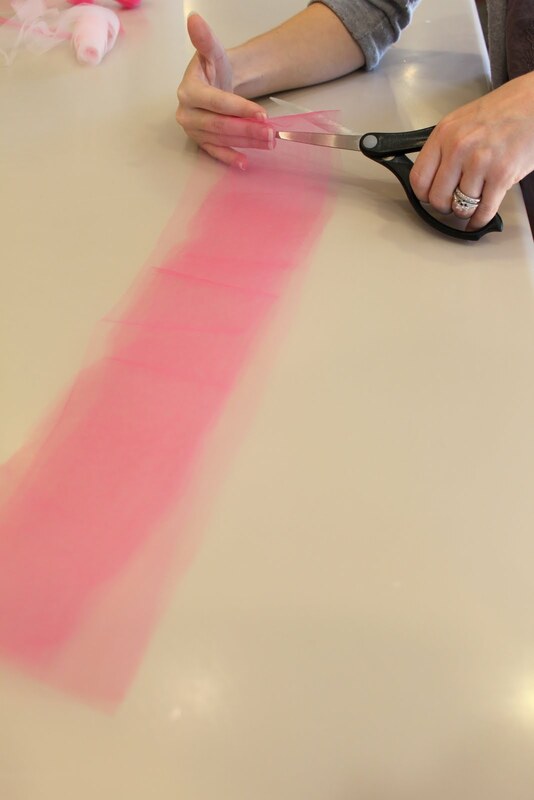 You should have enough tulle strips to fill in the entire middle section of the ribbon. You can even let your mom (who wished she was a princess her whole life :)) try it on. 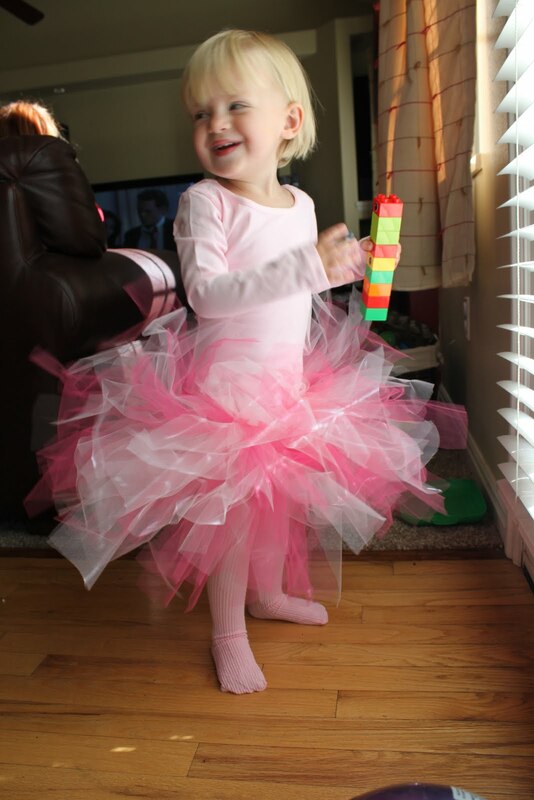 Have fun making your own colorful Ballerina or Princess tutu! haha great stuff! especially that picture at the end! I was thinking of making one for my daughter but adding a little bathing suit bottom and sew more of the tufts into it. Don't know if it will work...but worth a try.